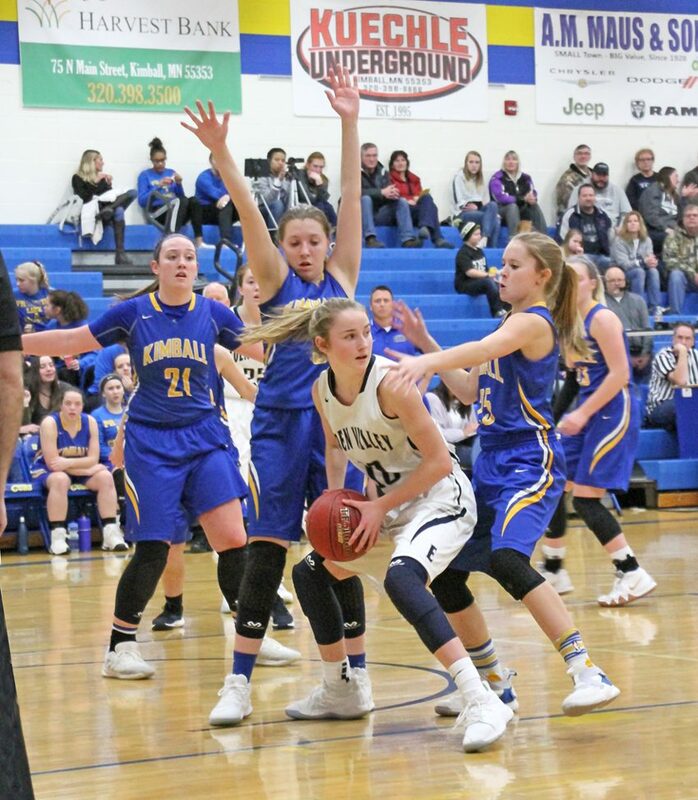 Kimball faced Central Minnesota Conference’s top two teams last week, starting with Belgrade-Brooten-Elrosa Tuesday, Jan. 22; and Eden Valley-Watkins Friday. 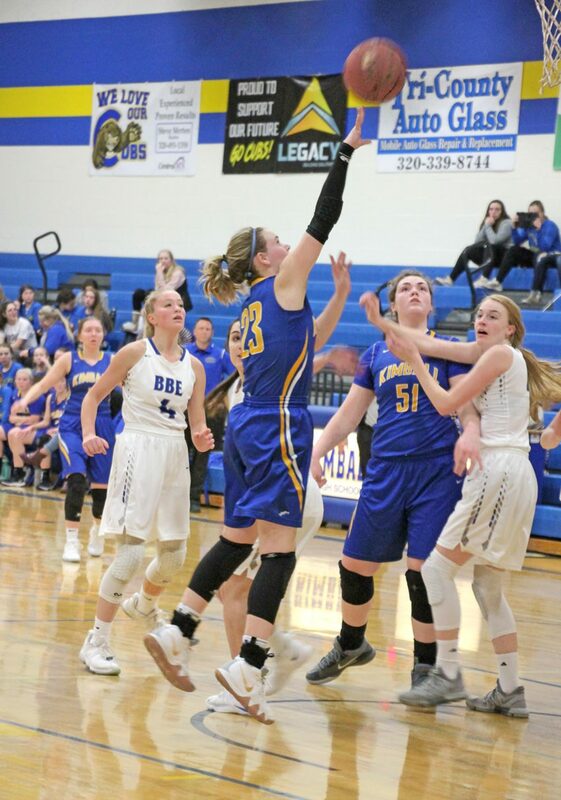 (BBE Game; BBE 56, Kimball 44) Erin O’Brien led the Cubs’ first-half scoring, as she put Kimball up 5-4, early on; then later on, tied the game, 11-11. Ashley Schindele’s trey tied it again at 14, halfway through the first frame, but BBE went on a 20-5 run to lead at the half, 34-19. The Cubs battled back in the second half, as Sidney Schreiner connected on a three pointer to cut the BBE lead to 53-42 with five minutes to play; but that was too much for Kimball to overcome. Kimball Stats: Erin O’Brien, 18 points, 18 rebounds, 4 assists; Sidney Schreiner, 10 points, 5 assists; Ashley Schindele, 8 points, 7 rebounds; Rachel Utecht, 6 points; Madelyn Hunt, 2 points. (Eden Valley-Watkins Game; EV-W 63, Kimball 28) EV-W brought their undefeated 16-0 record to Kimball and proved why they are ranked #5 in class 2A. The Eagles jumped out to a 21-1 lead with 11:40 to play in the first half and by halftime their lead was 40-15. The Cubs had no answers and came up short. Kimball Stats: Ashley Schindele, 6 points; Sidney Schreiner, 6 points; Rachel Utecht, 6 points; Cailyn Kuechle, 5 points; Madelyn Hunt, 3 points; Erin O’Brien, 1 point, 4 rebounds; Bailee Schiefelbein, 1 point. Kimball’s record drops to 7-11 overall and 3-4 in the CMC. Sidney Schreiner puts up two for Kimball in the first half against BBE Tuesday, Jan. 22. Photo courtesy of Amanda Garding. Kimball’s Rachel Utecht and Cailyn Kuechle put pressure on EV-W’s Brielle Kuechle Friday, Jan. 25. Photo courtesy of Amanda Garding.